Customers simply prefer using tap water from newly installed copper pipes. Unlike older steel or iron pipes, copper pipes do not rust, allowing clients to have fresh, clean water for years. When you are in need of Capitola repipe services contact the Gladiator Repipe team for all of your Capitola repipe needs. With the skilled team of repipe plumbers at Gladiator Repipe, you receive the highest quality of copper repipe services, at the most affordable price. Our skilled team of plumbers has become the repipe specialists in Capitola. We always come with customer reviews and workmanship warranties. What Does Copper Pipe Replacement in Capitola Require? Perhaps you wonder: “What does copper pipe replacement in Capitola require?” We will need to remove your home’s water pipes and replace them with the new pipes you ordered. We’ll need to shut off the water and carefully disconnect the old pipes. Then we’ll install brand new, clean water pipes in your home for you. We will always leave your home in a nice condition! When we turn the water on again, your family will notice its clear, clean quality! Call Your Capitola Copper Repipe Plumbers Now! 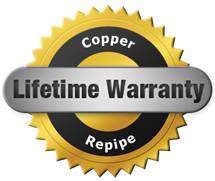 Whether your water looks dirty, your pipes are leaking, or you are just in need of whole house copper repipe. Contact us now to request help from skilled Capitola copper repipe plumbers. We offer estimates. Call Gladiator Repipe at 408-465-0025. GET A QUICK ESTIMATE NOW! Unmatched quality, exceptional service, done fast. Done right! Experience the Gladiator difference YOU deserve! Provide your family with clear water and increase water pressure. With competitive rates and experienced technicians, Gladiator Repipe is your premier choice for copper repiping services. From low water pressure to a high water bill, corrosion on exposed piping to rust-colored water, we’ll get to the source of the problem and take care of it for you. UNMATCHED QUALITY, EXCEPTIONAL SERVICE, DONE FAST. DONE RIGHT! Experience The Gladiator Difference YOU Deserve! © 2018 Gladiator Repipe | All rights reserved.